Cards fly everywhere in this intense card battle, you versus Zenco. 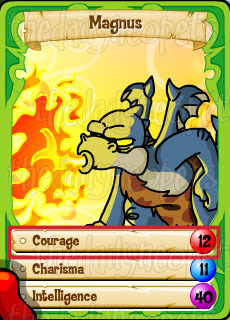 You or your opponent select a characteristic from the card you see and then flip them both over to battle it out. The winner of the battle gets points and both cards. Take all the cards and you'll be the new Master, but lose them all and Zenco will continue his reign! All commands are made by your mouse. The first thing is to decide which level you want. You get more points on the harder levels, but you lose control over Zenco's decision-making. On Easy, you choose for Zenco and there are no surprises. On Normal, you can influence Zenco's choice of category by clicking a "choose" button when his hand is pointing at the ability you want. His hand moves quick, though, so you may not always get the right category! On Hard, you cannot influence Zenco at all. The cards vary from game to game. 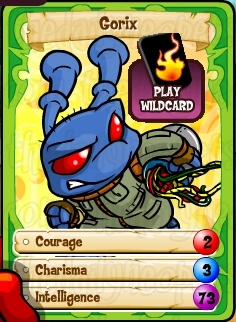 There are a total of 40 possible cards, but only 20 or 21 appear in each game, depending on if you use the Wild Card. This is your card! 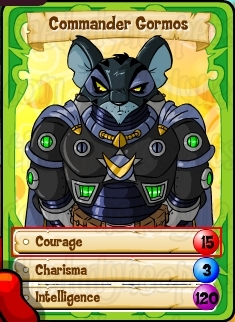 If it's your turn to pick, click on the the Courage, Charisma, or Intelligence attribute to challenge Zenco's card in that category. 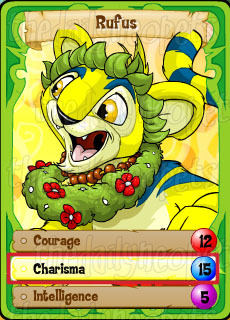 Each card is modeled after a Neopets character. On the left side of your screen is a Wild Card button. Clicking this will change the current card you have to Nightsteed. 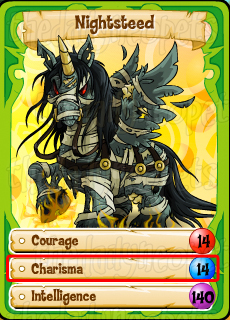 The Nightsteed card is always the Wild Card. 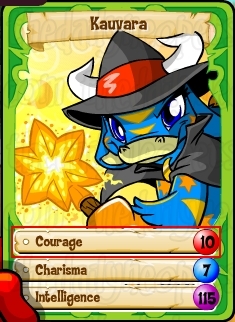 Zenco can never start with Nightseed, but can obtain the card if you lose it to him like any other. 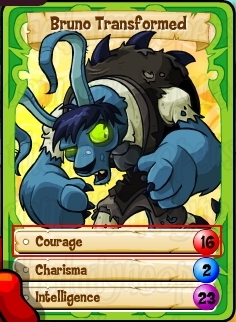 If you choose to play Nightsteed, the card it is replacing will disappear. In the upper left of the screen is a bar that keeps track of how many wins in a row you get. Every consecutive round you win, this bar lights up another symbol. Once you win 5 rounds in a row and fill up the bar, you will be awarded bonus points. 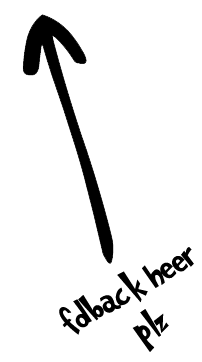 It is a large amount that seems to vary from level to level and game to game. Every time you earn a bonus or win a round, your score goes up. You earn more points on the harder levels. Click this to leave your game early. The Card Game Master Zenco sits opposite you. He makes annoying movements when you are picking, but just ignore him. This is only for Normal mode. When Zenco is picking, you can click the choose button to try and influence him. Whatever his finger is pointing at when you click Choose will be the category for that round. This bar represents how many card you have. Every time you win a match, the card you played and your opponents card are put in your deck. If you lose, you lose your card and it is put in Zenco's deck. The exact number of cards is to the left. You start with 10 cards and need 20 to win. Near the bottom and middle of the screen is what looks like an open hand of cards. Cards are put here when you and Zenco tie. Tie cards are held over until the next win and then given to that person. Tying is rare, and it can end in a big loss if you lose the round after a tie. This is the number of cards in Zenco's deck. The exact number is on the right along with Zenco's name. He also starts with 10 cards and your goal is to get him to 0. Brucey B is courageous for such a small Bruce. Back in Y2 he discovered the Lost Desert city of Sakhmet when chasing his lucky coin. 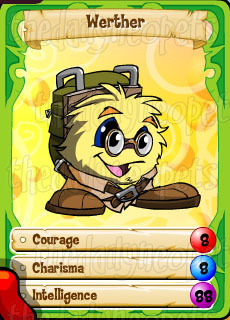 I would recommend using his courage attribute. 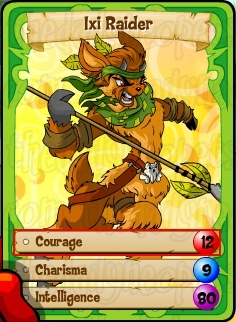 This card is one of the only pictures of Bruno the Gelert before he was transformed by the Neovian curse. Back then, he was quite clever, but then he was transformed and made an outcast after being blamed for the curse. It is best to use Bruno's intelligence attribute on this card. 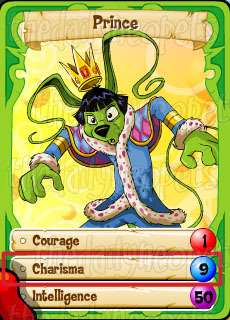 This card shows Bruno after he was transformed. After the evil Krawk gave everyone in Neovia a potion that eventually mutated them, they blamed Bruno and his family. They've hid from civilization ever since. 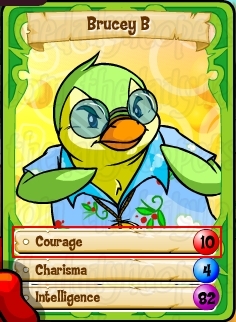 In this state, Bruno is not very smart, or charismatic, but one of the bravest Neopians ever. I recommend using Bruno's courage attribute. 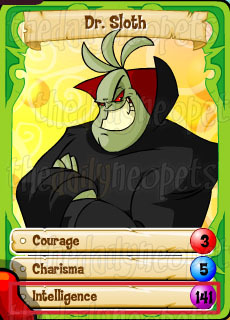 Captain Scarblade is a green, male Lupe who wants to destroy Maraqua. 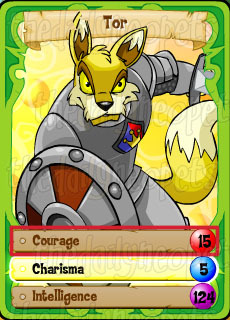 His courage level is only 2 levels away from the highest possible level, 16. 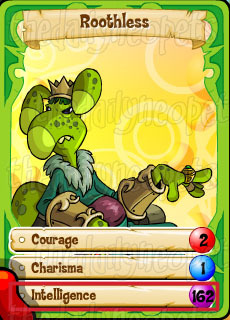 I'd recommend picking courage, but his intelligence is also a good bet. 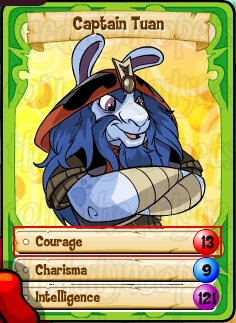 This Gnorbu sailed for weeks around Neopia, searching for his lost navigator, Hoban, who had been pushed off the ship by Chef Bonju. This was very courageous of him, and so I recommend using his courage attribute. In Y10, Gormos freed Gorix and Cylara, betraying his master, Dr. Frank Sloth. After that, he was viewed as a hero of the resistance by the Kreludean Grundos, though he did not see it in himself. 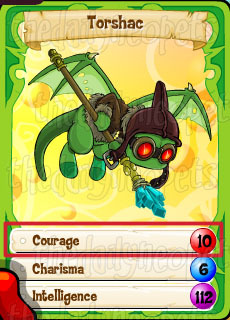 One of the few betrayers in Neopian history, Gormos is considered very courageous. 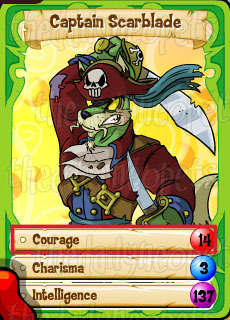 That caused him to get a 15 in courage, the second highest possible and therefore a strong attribute. Lucy (a.k.a the Plushie Collector) is very charismatic about her work. 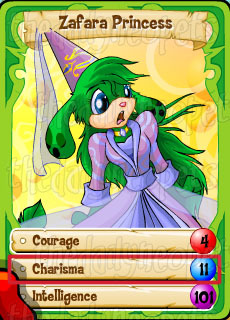 She is featured in Usuki Frenzy and owns the Plushie Palace . 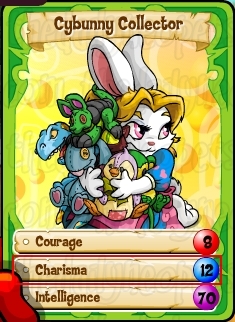 So it figures that not only is she pictured holding plushies, but has a high charisma attribute of 12, which I suggest you use. Cylara fought against Dr. Sloth together with Gorix the grundo. She is very courageous, so pick that skill. Dr. Frank Sloth is very smart, therefore choosing the intelligence skill is a good bet. Eliv Thade is a puzzle writer who lives in a scary castle! 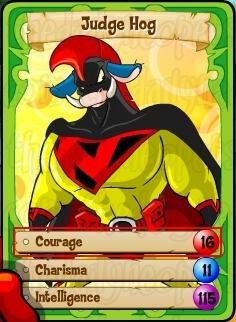 His courage skill is the best option, but this is one of the weaker cards. 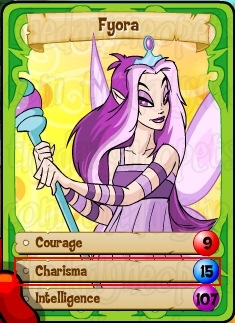 Fyora, queen of the faeries, and one of the most charismatic characters on Neopets. She is the most powerful Faerie in the world, and is known as the Lady of the Western Sky. 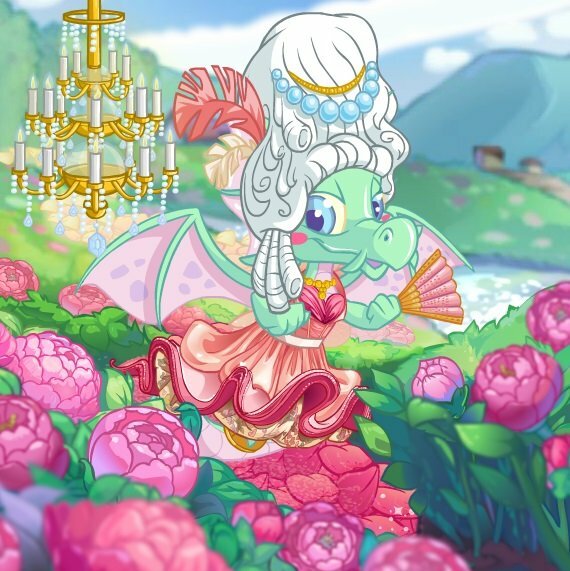 Fyora has ruled Faerieland for thousands of years, started the Faerie Festival held August 20th every year, and runs the Hidden Tower. She sealed the Darkest Faerie within a statue, saving Neopia. 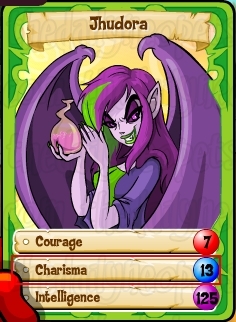 She has the highest charisma in the deck, so take it and run. Garin is the captain of the Black Pawkeet. 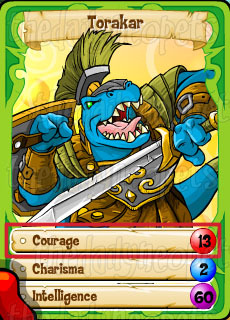 He helped defend Maraqua from an invasion by the dreaded Captain Scarblade. He is a pirate, though, and will still perform acts of piracy. He stole his own ship back from Captain Scarblade during the battle for Maraqua. 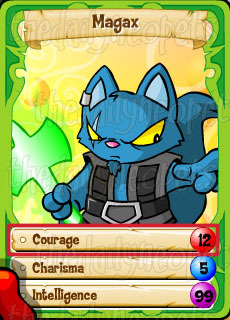 His charisma is rather high compared to other cards in the game, so I would use that. 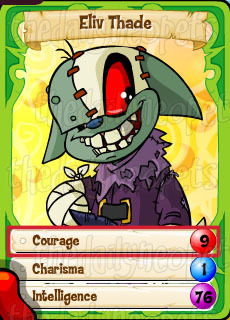 Gorix, arguably one of the most intelligent and courageous characters in this deck, is one of the worst cards! Back in Y10, Gorix and Cylara defeated Dr. Sloth once more, in the Return of Dr. Sloth plot. 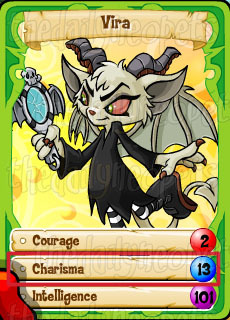 So for all their hard work, Gorix's card is awful! I'd have to suggest using your Wild Card here. If not, try his intelligence. Hannah is well-known throughout both Krawk Island and Terror Mountain for her ability to traverse the trickiest and most dangerous of places. 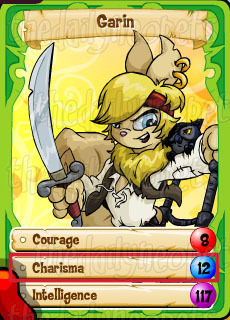 She is also known from Hannah and the Pirate Caves game. None of her stats are outstanding, but I would pick charisma. Take intelligence if you think you already have the more intelligent cards in your hand. Illusen is probably one of the best out there. 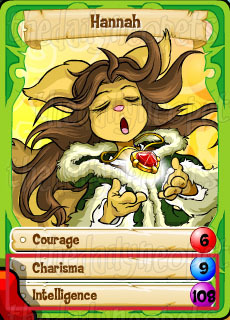 As a person, not only a card, she is very well rounded. 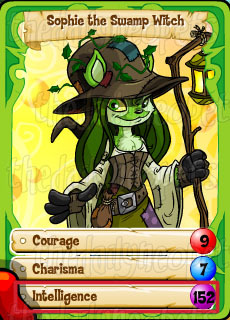 She and Jhudora presumably used to be friends, but nobody really knows. She now resides in Meridell, giving quests to those who seek them. 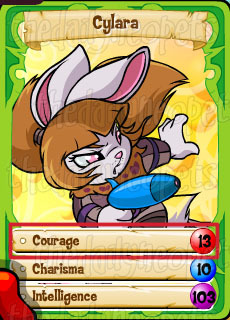 I'd say go with her charisma for this card, as 12 is pretty high. Isca can foresee the future in her dreams. Her charisma skill is the best option. 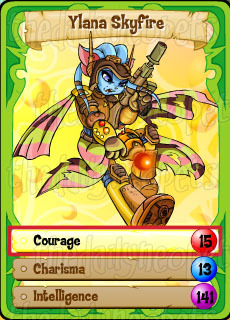 The Ixi Raiders, featured in the Darkest Faerie Video Game, are courageous. These centaur-like creatures attacked the village of Cogham in Meridell. They were defeated by Tor and his crew and then brought back by the Darkest Faerie. Tor defeated them once again. I would recommend going with courage, a nice 12. Jacques was one of the most courageous of the Black Pawkeet crew who helped save Maraqua. He was at one point captured by the drenched and saved by his friend Garin. 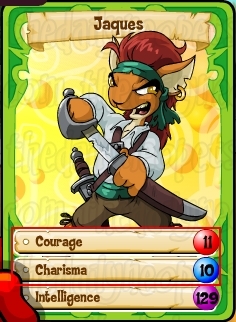 He later helped fight in the war of the pirates on the side of Maraqua because of his rescue. Go with either his charisma or courage. 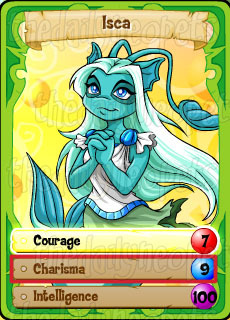 Jhudora, one of the most infamous Neopians, is very charismatic about her work as a Quest Faerie . Enemies with Illusen, no one knows what she does with the items you get her on her quests. I recommend using her charisma stat as it is at a whopping 13, one of the largest in the game. You can find Judge Hog and his fellow crime-fighters at the Defenders of Neopia Headquarters. He is very strong and therefore feared by many thieves and villains. 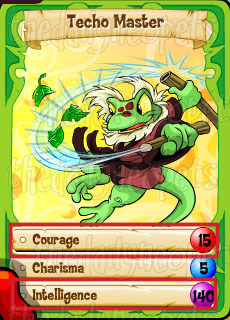 All of his skills are worth mentioning, but his Courage is the highest stat in the game. Only Bruno Transformed can tie him, so pick that one! Kauvara is the Magic Shop keeper. She is very into magic spells. You should pick courage for her, though intelligence is also decent. 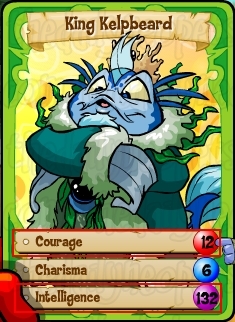 King Kelpbeard is a blue koi. He lost a war with pirates long ago and Maraqua got destroyed. Even though Maraqua is up and running again, he grieves over that painful day. Both his courage and intelligence are rather high. 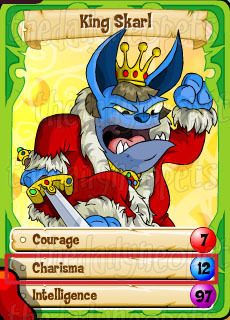 King Skarl is king of Meridell, however he is very grumpy. Make sure to click the charisma skill for him since it is rather high. 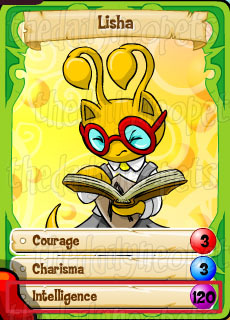 Lisha is a very smart Neopet. His intelligence is not the highest in the game, but it can beat most cards. Magax is a strong Wocky. You often see his name in combination with the word 'destroyer'. The best option he has is courage. Magnus the Torch is very strong. Make sure to use that in the game! His charisma isn't bad, either. The Meerca Brothers are thieves that bring a lot of chaos to Neopia. Choose their charisma skill. 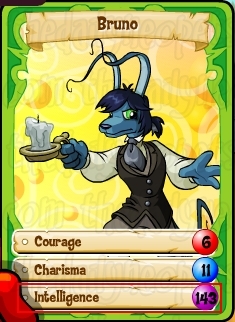 The Mynci guide is not a special character on Neopets. His card doesn't have any particularly strong characteristics either. Go with either charisma or the courage skill, or use the Wild Card. Prince is a yellow Gelert with absolutely no courage at all. He isn't very smart either, so use the charisma skill. Roothless is a smart and sneaky character! Make sure to pick the intelligence skill because it is the highest in the game. Rufus works with fruit and serves customers. 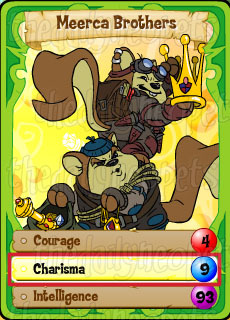 He isn't very smart, but is courageous and, most of all, his charisma skill is awesome. Make sure to pick that one. Sophie the Swamp Witch loves Meowclops. Together with Bruno they saved Neopia from an evil curse. She's very smart, so pick her intelligence skill! The Techo Master is from Mystery Island. He trains weak pets into strong warriors, much like him. Both his courage and intelligence are rather high, so pick one of those! Tor is a warrior. Choose his courage skill! Torakar is a strong Grarll. Make sure to pick his courage. 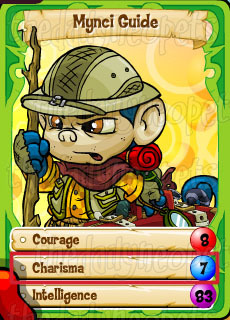 Torshac is a Shoyru scout. He has a lot of courage. Vira has got a high charisma, pick that skill. Another character that is not particularly special. He has average points on all skills, so there is no best one. Intelligence is rather low, though, so don't pick that one. Ylana Skyfire works for Dr. Sloth. She's got a lot of courage and a lot of intelligence. Either of those characteristics are likely to win. The Zafara Princess is very charming. Use her charisma skill. Nightsteed is your Wild Card. As stated earlier, Zenco will never have Nightseed in his deck except if you lose it. 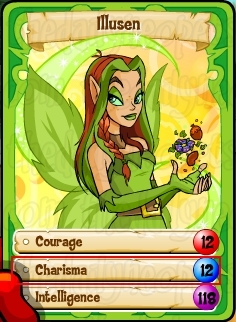 Unless you are facing Fyora or Rufus, use its charisma skill and you are sure to win! To get a high score, you have to play on hard mode. Hard mode isn't all that much harder. 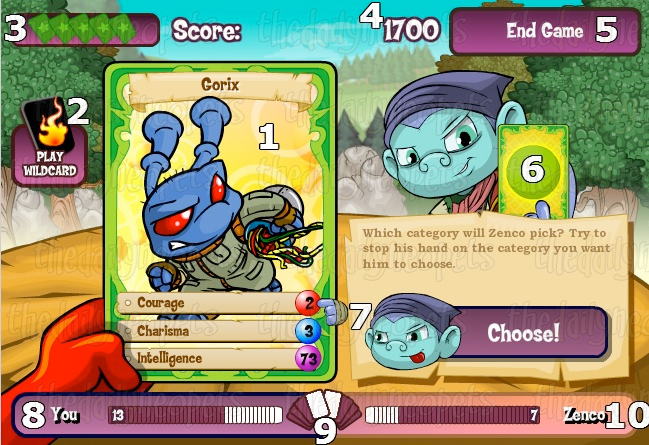 To max your points, whenever Zenco is almost out of cards, lose a round on purpose so that he has more cards again. This way, the game can keep going. Keep on losing, winning, losing, winning again until you get to the score you want, then finish him off! Another strategy is to keep track of where the cards are, especially the good cards. Did Zenco just take a strong card away from you? Try to remember how many cards he has. In that amount of turns, he will use the card against you again so you can plan to pick the weakest attribute of his card. This works best for people with a great memory, but as an alternative, you can write down where the cards are going. This game is fun to play every once in a while, but it is rather boring and repetitive if you want to get a very high score. It's usually not easy to earn 1000 neopoints either, so it's not a great money-maker. Good luck becoming the next Master! The Snowager is awake. He'll be sleeping in 1 hour, 59 minutes.